At CSSE at the University of Regina in May, our team was honoured to be involved in a session of the Association of Canadian Dean’s of Education (ACDE) called Visioning Environmental Sustainability Education in Teacher Education. The purpose was to gather ideas for creating an Accord on ESE in Teacher Education to be accepted by the ACDE at a future meeting. This session began with some members of our ESE-TE team sharing stories of their own journey and passions for EE. Yovita Gwekwerere (Laurentian) spoke about her upbringing in Zimbabwe and her work with Greenpeace. 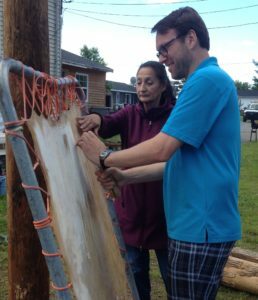 Patrick Howard (Cape Breton) spoke of his research with youth who have been impacted by the collapse of the Cod fishery in Newfoundland. Clinton Beckford (Windsor) shared his history in Jamaica and how island nations are being directly impacted by climate change through rising water levels. Maurice DiGiuseppe (UOIT) spoke about his proximity to nuclear power stations and the relationship of our built world to sustainability. Each of these stories evoked the complexity and uncertainty of climate change, and our role as teacher educators in addressing this. This was followed by a discussion by session attendees, many of whom are Deans of Faculties of Education across Canada, as to what has been done so far and what direction should an Accord take. It was decided that a draft Accord should be presented to the next ACDE meeting, with a clear rationale for the inclusion of ESE in Teacher Education, about its connections to Indigenization, and the importance of building partnerships in communities. This Accord should also emphasize the contextualized nature of ESE, embodied through a place-based approach. Our ESE-TE team looks forward to supporting the creation of this Accord for presentation at the next ACDE meeting in late October. If you have any thoughts or insight, please contact us. Going to bat for Bats at Brock! 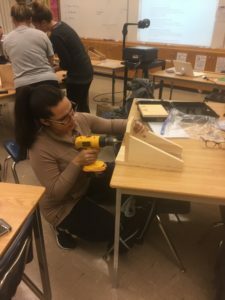 A Brock teacher candidate assembling a Bat House. Brock University has been running an optional course on Outdoor and Environmental Education (OEE) over a number of years. Most recently two sections ran in the fall of 2017. The teacher candidates represented PJ, JI and IS levels as well as both programs, namely consecutive and concurrent education.